As I walk through the park every morning, I continue to notice some leaves begin to change on the trees. And even though that makes me instantly depressed because I know that the winter months are close, I get excited for those cooler fall days with lightweight jackets and sweater dresses. So when I found this loose fitting Lolë sweater dress, I couldn’t wait to style it for fall. I even wore it on my first day in Montréal when I recently went up north to visit the offices of Lolë and attend the Lolë White Tour! But before I go into how obsessed I am with this sweater dress and some of the new jackets from Lolë, I want to tell you a little bit about my trip to Montréal! Well, Montréal is pretty much the best. That is, in summertime. I definitely don’t want to experience it in the dead of winter when it’s full-on blizzard season. But summertime is a whole different experience there. 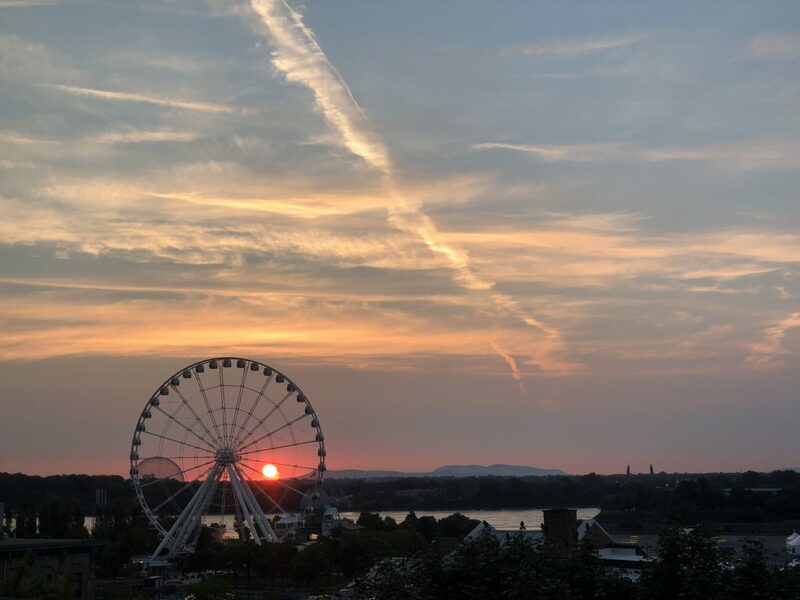 This was my first time in Canada and the Montréal weather was in the 70s-80s the entire time, with STUNNING sunrises every morning from my Hotel William Gray balcony in Old Town. Montréal is the second largest primarily French speaking city in the world, after Paris. And almost everyone there is bilingual or speaks multiple languages. It’s so culturally diverse and I loved not knowing where anyone was from when I would meet them. And in Old Town Montréal, you feel like you’ve stepped back in time with the Colonial era buildings and cobblestone streets. But the best part of Montréal is the French food. French food is pretty much the best and it’s something I barely get to experience here in Denver. 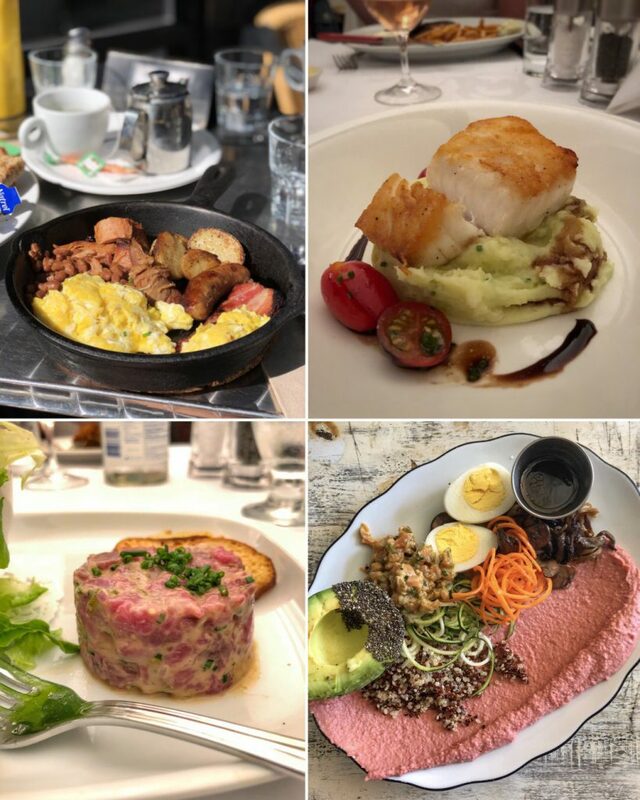 While I was in Montréal, I ate at Maggie Oakes, Le Cartet, in the Bota Bota spa (which was the BEST spa I’ve ever been to), Leméac, Mimi la Nuit, and Tommy. And everything was absolutely delicious! I’ve never had so much salmon and beef tartare in my life. To.Die.For. And while I was in Montréal, I was lucky enough to hang out with the Lolë team to see the city and get to know the company more! 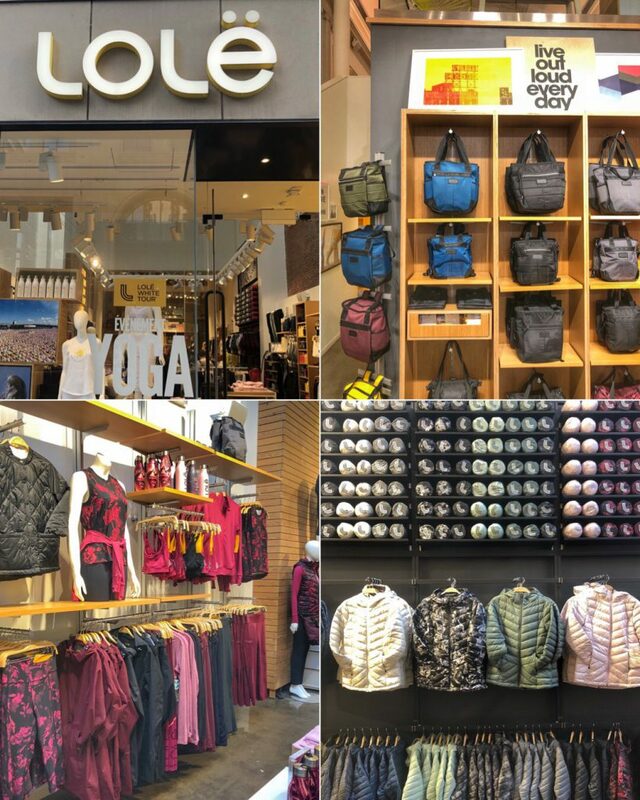 I saw the Lolë offices, I had a private yoga lesson with Lolë’s amazing Ambassador – Marie Françoise Mariette, I visited the Lolë flagship store on Saint Catherine Street, and then I was able to participate in the annual Lolë White Tour. If you haven’t heard of the Lolë White Tour, it is an event where thousands of people come dressed in white as a symbol of peace, to practice yoga and meditate in a unique session together. This event brings together communities from around the world to celebrate inspiration, hope, equality and unity. How rad is that? The event has gone on in Paris, New York City (in Central Park! ), Barcelona, Montréal and Toronto. And this Montréal event was on the Jacques-Cartier Pier with beautiful views of the water and Old Town. Once you walk into the event, you’re greeted with a giant gift bag, free yoga mat, and a vendor village filled with all sorts of snacks and products from the sponsors. It really is such a cool experience to be in the middle of thousands of people in complete silence during the meditation. I’m not huge into yoga or meditating and I still loved the event! Plus I met a ton of cool people at it! But enough about Montréal! Let’s talk about fall outfits!! Because fall is truly my favorite season when it comes to clothes. Lightweight sweaters, layering and hats are all my go-to pieces. And since Lolë truly has the BEST WINTER JACKETS EVER, I know I can rely on them for warm jackets no matter what season they are for. And this Eugenie Top is perfect for layering! It is insulated in the front & back with LOFTECH™ which is a vegan alternative to natural down! LOFTECH™, which is made by ALLIED feather & down, has the loft of 625 fill-power and the warmth of 700 fill-power goose down. Its synthetic clusters mimic natural down which provides a real down feel and look. Plus the Eugenie Top is made of Spacer fabric which is a specialized 3-dimensional textile that uniquely facilitates air flow, breathability, and lightweight shape support. This all means it is perfect for packing with you and layering when the temperature changes during the fall season! Now let’s get into this Sika sweater dress! It’s a sporty terry fabric which means it holds it’s shape no matter how much sitting and standing you’re doing through the day. And it’s warm enough to wear without any leggings, unless it gets extra chilly out, then it’s great to wear with some leggings and tall boots! Plus it also comes in grey, berry and green! But my favorite part of this entire outfit is DEFINITELY the Quilted Lily Bag. I have about 3-4 of these bags and they are LIFE CHANGING. Sorry I keep yelling at you but I can’t say enough about these bags. I take my Lily Bag everywhere with me whenever I travel since it’s the perfect size to go under your seat on an airplane AND it comes with backpack straps! Plus it has about a million different pockets. It has a place your cellphone, a clear pocket that I always put my passport in, a spot for your laptop, a pocket for your water bottle, and it even has a spot for your yoga mat! It’s truly the best! And the bag comes in so many fun colors! I just love it! I even had a PaleOMG reader reach out to me recently and thank me for turning her onto the bag because she loves it for travel now. 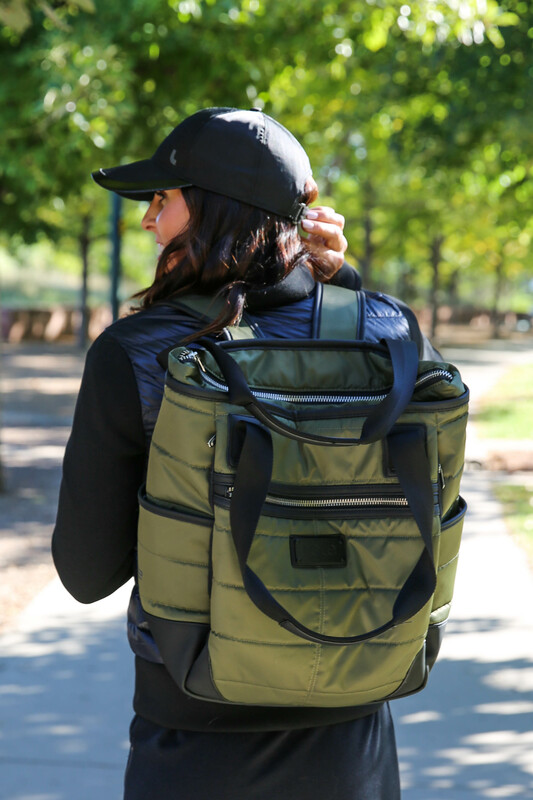 If you’ve been in need of the perfect gym bag or just a travel bag, this one is the answer to your prayers! Getting the opportunity to meet the Lolë team in Montréal and fully experience the Lolë White Tour was unlike any trip I’ve taken before. Lolë cares so much about their communities and wants to bring people together and empower them to make a difference in this world. And while I was touring the Lolë offices, I got a sneak peek at their winter and spring collection. There are so many amazing eco-conscious items to choose from while they continue to try to create items that are better for the environment. And guess what? They just launched their Men’s line yesterday! So pumped to grab my husband some items from my favorite athleisure-wear brand! Be sure to follow Lolë on Instagram to stay up to date with any upcoming events and new styles they come out with! Love the shoes! Where can I find those? They have a great website! What size is your dress? Looks super comfy and great on you. Hi Juli! You’re rocking everything you’re wearing from Lole! How’s the sizing? I’m pretty tiny (2 in Lululemon and XXS in Athleta). Do you think I could get away with the XS? With all of your experience traveling, could you write a post about packing in just a carry on, best outfits for travel days in an airport, and maybe just some other tips you’ve picked up along the way? I’m going to Mexico in Nov and I really want to use my delsey chatelet carry on for the 5 days, but I’m not sure if I can do it. Would love some tips. Thanks so much!